Get Away From It All: This is the ideal place to relax and unwind from the pressures of our fast paced life. While private and peaceful, you are still right in the center of all the great activities and special attractions that Maine has to offer. From your lakeside home you are less than 2 hours from 90% of the most popular attractions. The beauty and serenity of this property will have you yearning for a return visit. Perfectly set up for large families or family and friends. Play horseshoes, badminton, frisbee, swim, fish, boat, waterski, jet ski, kayak, canoe or just lay on the shore and soak in the sun and sounds of the lake. In the evening toast marshmellows, make samores, tell stories or sign songs by the campfire on the shore of Lake Annabessacook. Listen to the loons or watch the moon dance on the water. Sit on your private deck or balcony and sip coffee or tea while watching the sunrise over the lake. Pull up a chair and good book and get lost in another world. Semi retired professional, preparing for retirement and part time missionary work. Beautiful views of Lake Annabessacook, private sandy beach, quiet peaceful vacation time, large lawn, comfortable 3 bdrm house. It just is nice and relaxing to be here. Private, quiet, peaceful, but close to town and the highways. You are only an hour from the coast, mountains, Portland so access to everything Maine has to offer, but the quiet beauty of the lake at your fingertips. Towels are included for bathing, recommend you bring your own beach towels or beach blankets. No shampoo or soap supplied, bring your own personal items. One hair dryer included. Very private, peaceful setting. Ideal for relaxing and making memories. Fabulous sunrises. Sandy private beach with outdoor fireplace. Two sets of bed sheets available for each bed, one bath towel for each person. Full size washer, provide your own detergent. Also a near by laundramat that does laundry and folds for only a little over a dollar a pound, great service if time is a factor. can fit several cars, but no large motor homes. Bring you own beach towels or beach blankets, plenty of house towels for shower and bath. Sunken living room overlooking the lake with lots of seating and 32' flat screen HD TV with satellite dish service, overlooks the lake. Regular drip machine as well as new Keugig, so you can bring or buy your favorite pods. some common items like salt, pepper, and spices oils etc. dinning table expands to fit eight, plus stools at kitchen counter for two more. Several folding tables available as well. Two Satellite HD receivers full Dish Network programming on the living room and master bedroom tv with antenna programming on kids room and downstairs bedroom tv dvd player for all rooms. fair amount of life vests, but suggest bringing own to ensure proper size and fit. Living room has double french doors leading to a spacious deck overlooking the lake. Movie library, book library and family games for rainy days or evenings. Foosball, ping pong, badminton, and horseshoes available for active games. Large lawn for play, bring your frisbees, football, or baseball glove and ball. DIRECTV service with TV's in each bedroom and living room. Computer work station with wireless Internet access and computer capable of email and internet surfing. Full kitchen including a large George Foreman Grill, electric skillet and toaster oven. Martini glasses, drink mixer, beer mugs, wine glasses and wine cooler on hand. Salt, pepper, and initial supply of paper products like paper towels, napkins, paper plates and dish detergent on hand. Bring your own favorite cooking spices. Beach side fire place for night time fun by the lake, plenty of local sources for fire wood. Two kayaks and one Old Town 16 foot canoe available. We had a wonderful stay at Loon's Rest this summer. The rental house was clean, spacious, private, and had all the "comforts of home". Even though the lake level was low this year (not much snow this past winter and not much rain this summer), the grand kids still had lots of fun catching fish off the dock and chasing frogs at the end of the beach. The lake was perfect for the kids first time tubing behind a boat...they also loved roasting marshmallows over the fire-pit. Plenty of golfing nearby and some great farm stands and restaurants in the surrounding towns of Winthrop and Monmouth. This was a very enjoyable family vacation; great weather, great place to stay, and a great time had by all! Thanks for your kind thoughts. It was a very low snow fall this past winter, so the lake level was lower than normal to start and the lack of rain fall did add to the lower than normal lake level, but even with that decreased water level, the clarity and quality of water was still very good and the fishing, swimming and boating was still great. Glad you and the family had a great summer vacation time. What a wonderful house and location! The house had all we needed, plus some extras like water toys and puzzles that our girls enjoyed playing with. The shallow, sandy beach area was great for the kids. We enjoyed the deck, rising early to catch a beautiful sunrise on the dock, and canoeing to the big island for a little exploring. The location was great for an ocean day trip to Reid State Park (beautiful), hiking Monument Hill Trail in Leeds, and picking berries at many of the local raspberry and blueberry farms. The home has great seclusion, yet is not far at all from many amenities. We hope to be back! I would highly recommend this vacation rental. The property is very private and peaceful. The rental is great for younger children. The lake is very quiet and easy to navigate with the kayaks and canoe provided with the rental. Make sure to explore the big island in the middle of the lake. The property has easy access to a Hannaford grocery store right in Winthrop. Make sure to visit Fast Eddies Drive In restaurant and the quaint town of Hallowell. Brad is a fantastic host who is always available to help in any way necessary. We have stayed here two years in a row and hope to come back! We have rented this property three times and always enjoy our time. It is a beautiful location with privacy and comfort. The water front is shallow, but with a sandy bottom. We had a great time and would rent again. Brad is great to work with and really cares about providing good customer service. Great location! Perfect shallow and private beach area for kids. House had plenty of room for 8 people and was in a private location. The lake is quiet and fun to putt or paddle on. We had a great time. We had a wonderful vacation! The private sandy beach was perfect for our children (2,4). This house is very private and the large backyard is great for outdoor family activities. The kayaks and canoe were nice for exploring the lake. Big Island is a must see. The kids enjoyed the beach and walking trails on the island. The house was very well stocked with everything we needed and more. Thanks again for a great week! Only minutes to the center of Winthrop Maine, but right on the lake with privacy on both sides, looking out on beautiful Annabessacook lake with islands, loons, and many other wildlife. Great lawn extending down to your own private sandy beach. Other Activities: boating, swimming, fishing, movies, shopping, eating out, golfing, tennis, bowling. 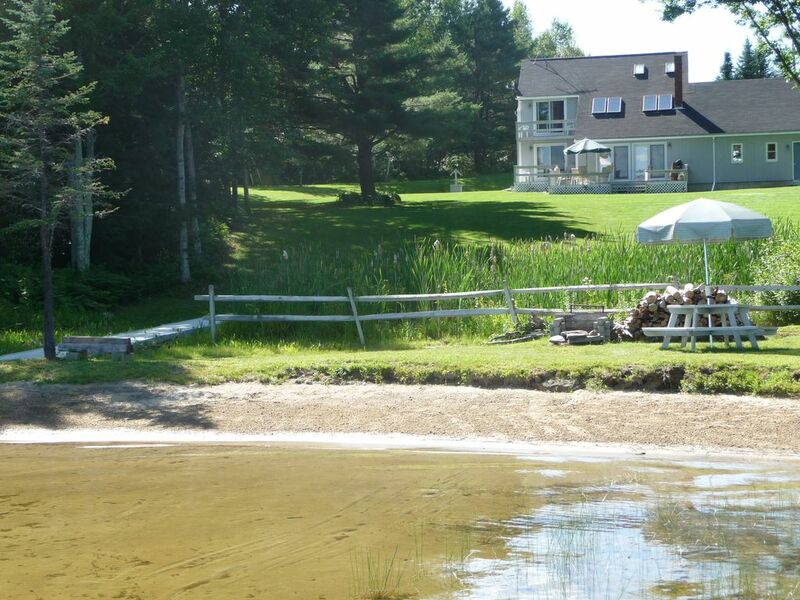 You are in the heart of central Maine's lake district with many nearby lakes to choose from. Excellent fishing, boating and swimming. Annabessacook Lake is only minutes to Cobbossee Lake and Maranacook Lake. Golf: Only 15 minutes from golfing at three different courses and 45 minutes from at least a dozen courses. Beaches: Only an hour to the coast of Maine with many, many beaches and attractions. Shopping: only 15 minutes to a nearby mall, about and hour from the Portland Maine Mall and about 45 minutes to LL Beans and Freeport Maine. Ski: An hour's drive to Sugarloaf, Saddleback and Sunday River ski areas; some of the best sking in New England. Monthly Off Season Rate covers internet, phone, satellite tv service and electric. It also covers plowing. Oil heat is not covered, the tank is filled at the start and renters pay as they need it and fill the tank before leaving and pay for that oil, leaving the tank full like they found it. Much like a rental car. If that is not done then the oil cost is deducted from the security deposit.